The new Cat D6T Dozer features a new, fully automatic transmission to optimize performance and achieve fuel savings of up to 20 percent in heavy work and as much as 30 percent in light work and finish grading applications. 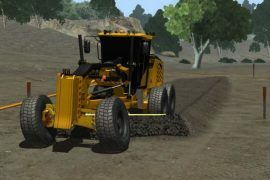 The fully automatic bulldozer is easier to operate – just set the desired ground speed and the four-speed transmission will set the powertrain for optimum efficiency. 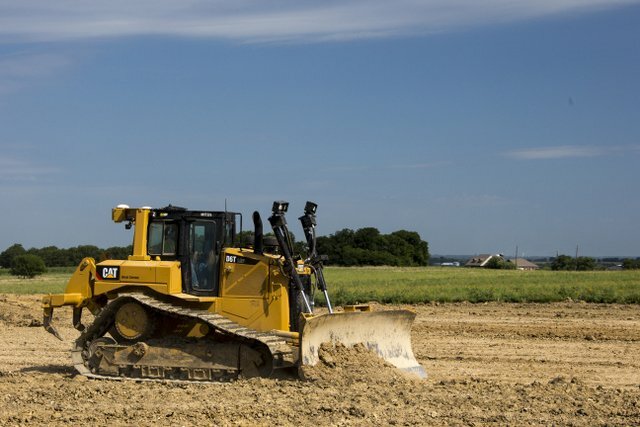 Availability of the full range of Cat Connect GRADE for Dozers technologies enables equipping the D6T for the application. Cat GRADE with Slope Assist is now standard on the D6T, providing basic blade positioning assistance without the need for added hardware or a GPS signal. The new D6T uses a fully automatic, four-speed, power-shift transmission with an integral lock-up clutch to provide a significant increase in fuel efficiency. The operator simply sets the desired ground speed, and the Auto Shift system smoothly and automatically chooses the optimal gear and engine speed to match operating conditions. The new D6T transmission adds a gear between first and second ranges for smooth shifting and to maintain power to the ground during load changes. 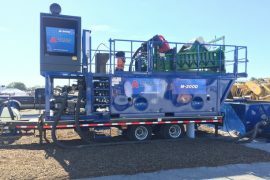 The added gear allows the machine to remain in the most efficient mode for a higher percentage of the time. The operator experiences an aggressive feel in the dirt, as well as up to 2.5 percent greater productivity. Powering the new D6T is the fuel-efficient Cat C9.3 ACERT™ engine, Tier 4 Final certified with a net power rating (ISO 9249/SAE J1349) of 215 horsepower (161 kW). 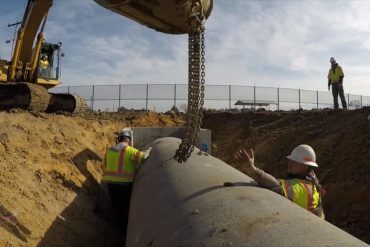 Cat Connect GRADE technologies help get work done more efficiently and more accurately. With the D6T, customers have a wide range of technologies to choose from—to equip their dozers to work best in their applications. 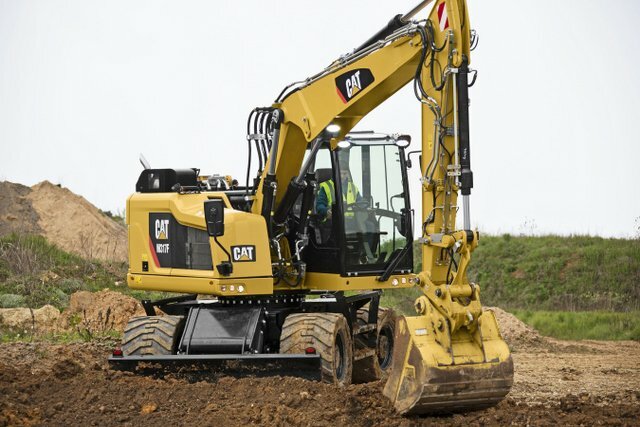 Technologies range from simple grade indicators to full factory-integrated GPS, all supported by Caterpillar and Cat dealers. • Cat GRADE with Slope Assist, a new standard feature for the D6T, automatically maintains pre-established blade position without the need for added hardware or a GPS signal. • Cat Slope Indicate, (standard), displays machine cross-slope and fore/aft orientation on the primary monitor, assisting operators to work accurately on slopes. • Cat Stable Blade, (standard), complements the operator’s blade-control input to achieve finish grades faster with less effort. 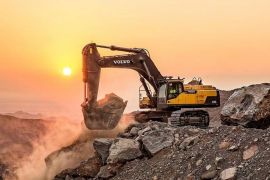 • Cat GRADE with 3D is an available, factory-integrated grade-control system that provides three-dimensional guidance both for production dozing and fine grading. The system feature roof-mounted antennas, and the Cat AccuGrade Ready Option is included with the system, as is the AutoCarry™ system that adjusts the blade for optimum load retention. • Cat AccuGrade is a dealer-installed after-market grade-control system that provides the flexibility to scale system features to changing needs, ranging from lasers for 2D flat-plane and slope work, to systems using the Global Navigation Satellite System (GNSS) or universal total stations for complex contours and precise finish grading. • AccuGrade Ready Option allows the machine owner to upgrade to an AccuGrade 2D or 3D system as requirements demand. The new Cat M315F and M317F compact radius wheeled excavators are additions to the recently launched Cat F Series wheeled excavator range, reflecting the same customer focused design concept of their conventional radius counterparts, but providing customers the added choice of compactness. The new models make no compromise in power, performance, or stability, compared with their non-compact counterparts, and feature large working envelopes, high breakout forces, and high lifting capacities. 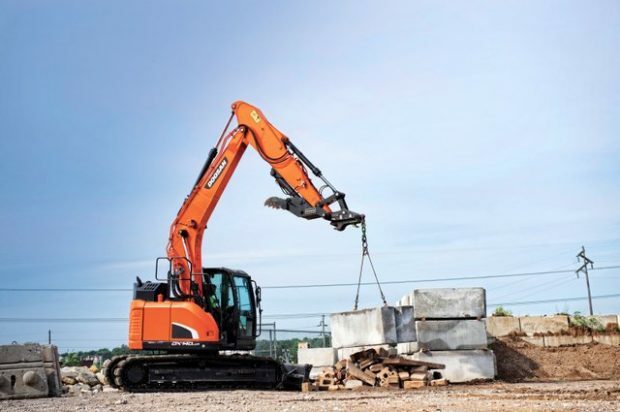 The M315F and M317F are designed as tool carriers, having all necessary systems to change attachments in seconds from the safety of the cab, including medium and high pressure auxiliary hydraulic lines, and a monitor based tool control system. The tool control interface allows programming the machines for up to ten different flow/pressure settings to accommodate a wide range of work tools. Specific auxiliary functions are assigned on the joystick and foot pedal, allowing the operator to choose directly, through the monitor, which button and/or slider is preferred for a specific work tool. 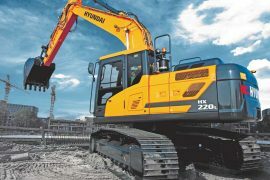 Work tool controllability is ensured for the new models with a load-sensing hydraulic system designed to provide fast cycles, generous lift capacities, and high bucket and stick forces. The machines have dedicated pumps for the swing function and for implement functions, resulting in faster, smoother combined movement. The hydraulic system also reduces the load on the engine by matching flow to load demand, translating into lower fuel consumption. The 150 hp (112 kW) Cat C4.4 ACERT engine meets U.S. EPA Tier 4 Final emission standards and integrates an emission aftertreatment system that requires no attention other than periodically replenishing the diesel exhaust fluid tank. 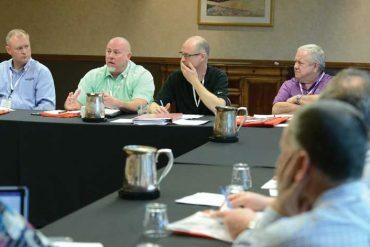 Emissions technology includes the Cat NOx-reduction system, selective-catalytic-reduction system, diesel oxidation catalyst, “fit for life” diesel particulate filter, and high-pressure/common-rail fuel system. The C4.4 ACERT engine provides quick response to changing loads while delivering constant power. 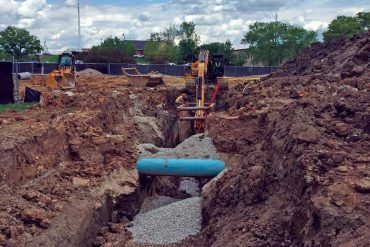 It is designed to provide powerful, reliable performance in all operating situations, whether utility repair along urban streets, road construction, or large earth-moving projects that involve heavy-duty digging and lifting tasks. For optimum fuel efficiency, the new machines feature Automatic Engine Speed Control that lowers engine speed when maximum power is not required. An engine idle-shutdown system also saves fuel by stopping the engine after a preset idling interval. In addition, the Eco Mode reduces engine speed to save fuel, but does not compromise power or performance. The automatic shift-to-travel mode optimizes driveline performance, while also conserving fuel, and the cooling system features a variable speed, on-demand fan for further fuel savings. The M315F and M317F share the same spacious, comfortable cabin as non-compact models, featuring automatic climate control with air conditioning, adjustable steering column, fully adjustable seats, and adjustable sensitivity for joysticks and controls. The roll-over-protective-structure (ROPS) operator cabin also features high pressurization to keep the environment dust free, low sound and vibration levels, and expansive visibility with a large, all glass door, wide angle mirrors, and a large skylight. 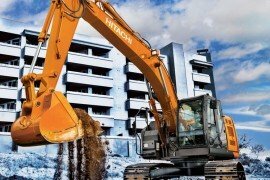 F Series wheeled excavators also incorporate a PIN-code anti-theft system. The standard lighting package includes a light for the standard right side camera, counterweight light for the rearview camera, three cabin mounted working lights, and a light on the boom. LED lights are standard, providing enhanced illumination, lower power consumption, and longer life. The right side camera has a separate in-cab color monitor, which also can display rearview camera images simultaneously. 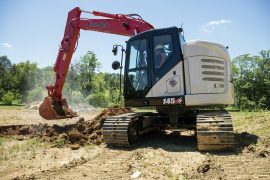 The M315F and M317F feature a cruise control system, and an automatic brake/axle lock system detects when the service brake and axle need to be locked or unlocked and handles that task for the operator. Automatic swing and travel lock functions eliminate the need to release the swing lock pin. The new Cat M315F and M317F will be available in early 2017.